Marlijn van Straaten joined HMSHost International early 2016 as Vice President Marketing and Communications. As part of the Executive Leadership team, Marlijn plays a key role in the strategy process of HMSHost International, sketching the business meeting the needs of the rapidly growing company. In leading all marketing and communications B2B2C and brand developments in airports and other travel venues, Marlijn seeks out opportunities to introduce well-known brands into new markets or expand the business by bringing new brands into existing markets. It is this combination of strategy and sophisticated marketing activations that help HMSHost serve the needs of all guests worldwide. A passionate people person, Marlijn believes strongly in the value of internal culture and she is naturally driven to cultivate robust teams of committed people around her. 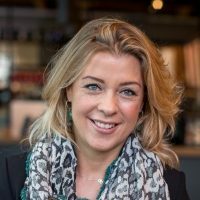 Her compelling track record in business strategy and marketing across the travel F&B and retail industry includes positions as head of Commerce Retail and Food & Beverages at Amsterdam Airport Schiphol and several Brand management positions in the Fast Moving Consumer Good industry. Marlijn has a Bachelor of Business Administration from Hotelschool The Hague and gained her MsC in general management at Nyenrode University.